The two-letter word ‘Digital India’ is rightly construed as the ongoing revolution to ensure that public services are made available to every citizen electronically by making the country empowered with cutting-edge digital technology. Digital India necessarily includes three important components and they are, development of secure and stable digital infrastructure, delivering government services digitally, and a drive for universal digital literacy in the country. One of the most perceivable windfall effect of the ongoing thrust on digitalisation in India is the sudden and considerable high demand for Cyber Security professionals. The demand is so high that government entities and private enterprises are ready to pay very high salaries and provide the best of incentives to the best suited candidates. Digitalisation has engulfed our everyday lives and every aspect of our life is dependent on it with the digital technology influencing everyone’s life. However, some unscrupulous elements have also been using digital technology for unlawful and criminal activities. Importantly, it is not just an individual’s life that is under threat due to digital insecurity, the whole of society and even the nation stands the risk of loss and damage without a blanket of foolproof digital security in present times. Organisations are waking up to this reality and corporates are keeping apart a major chunk of their budget for digital security cover. Despite the organisational priority, constraints of efficient work force is a major bottleneck in this endeavour. The truth is that India is facing a scarcity of cyber security professionals at all levels. The insufficiency of professionals increases exponentially at the leadership level as presently in India there are only a handful of brains who have the experience and know-how to manage a group of cyber experts. Independent estimates put the increase in the salary levels of Cyber Security professionals to around 30 percent in last one year. What is compelling companies to recruit? *Government push asking enterprises to deal digitally has forced organisations to considerably increase their workforce. *Demonetisation has made most financial transactions compulsorily go the digital way. *Threats of hacking and cyberattacks are imminent and companies are taking no chances. *Cyber Security talent in India is rare and companies do not want to be late in recruiting them. *Cyber Security team directly reports to the topmost leadership and are accountable towards the very identity of the firm. *There is no limit to the annual compensation for a Cyber Security brain as companies cannot afford to compromise on their digital scrutiny. *Flexible work timing and ease of operating remotely. *Best minds are revered and merit is the key rather than any other considerations like seniority or organisational policy. *Young people have priority and people ready for regular learning opportunities are part of the job profile. A Cyber Security professi-onal is expected to perform varied kind of duties like ethical hacking into an organisation’s digital interface and IT network to find out what security loopholes exist and suggest ways to fix them at the earliest possible time. He is expected to carve out a security policy of an organisation and even manage a team to remote manage a security product for the organisation like firewall. The expert is incharge of the security audit and when required he is also the person who has to perform the clinical investigation of IT related crimes and frauds. The person is also responsible for digital training and capacity building of the organisation. Some of the job profiles in the field include- information risk auditors, firewall and security device development professionals, security analysts, intrusion detection specialists, computer security incident responders, cryptologists, vulnerability assessors, lead security architects, chief information security managers, cyber security consultant, digital forensics expert, SOC engineer, ethical hacker, threat management specialist, malware analyst, threat analysis manager etc. The entry level role as an Information Security Executive would include role of correlating broad security guidelines of the organisation with security operations. The middle level Manager profile may have role of security program management, data security and disaster recovery. Senior and top level Manager position requires to play the role of design and development of information security policy and ensure regulatory compliance along with information security governance. The top level in this paradigm of career also have the role to justify the cost of ongoing and future investments to mitigate information risks as well as to align business objectives with a concise security strategy. If you made up your mind to grow and make it big to learn and grow in the field of Cyber Security, it is always advisable to back up the courses and qualifications with practical training and apprenticeship. Learning things practically in the company of a good team is key to the growth and development in the field. Even when you are choosing an institution for training, make sure to check if it has a practical learning provision as part of the training. 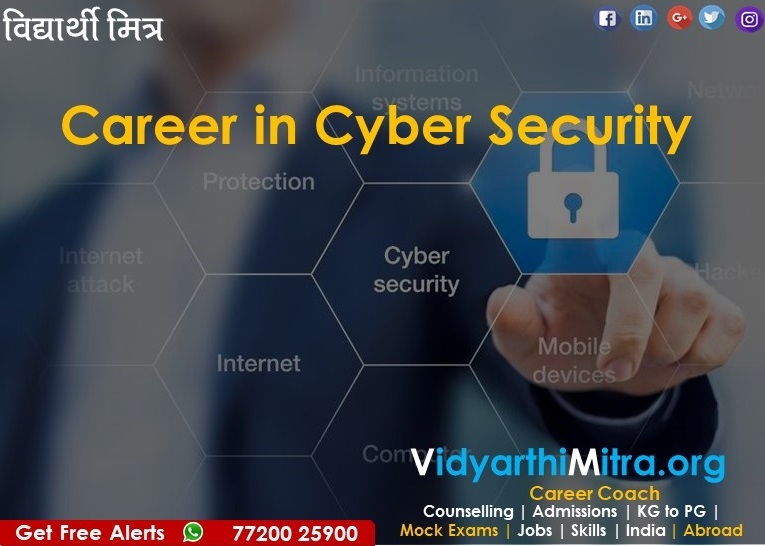 With the everyday occurrence of data leaks, widespread attacks on digital infrastructure and privacy breaches, the career in Cyber Security is here to stay and grow higher with every passing day. Self updating and a keen interest in evolving technology is paramount for growth.